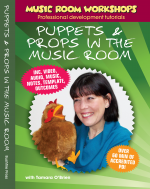 Suitable for music teachers looking for engaging ways to include puppets and props in their program. Nothing captures a child’s attention and imagination quite like a puppet! This workshop will give you loads of tips, tricks, songs and games to use with puppets and small props. Build confidence in your students and encourage their creativity with body and voice. Join Tamara O’Brien, author of the internationally acclaimed We’re Orff! program (and international music education presenter) on a close encounter of the puppet kind! All the resources included in this product are sent to you on a convenient USB drive. Most of all, they are fun and engaging to work with and will excite all children in your class.